A Confabulation of Over One-Hundred Unique MONSTERS for The Dungeon Crawl Classics RPG (DCC RPG) and Suitable for Other Sword & Sorcery Role Playing Games, Including Those of The Old School Renaissance (OSR). These are monsters in the the original sense of "anything that's not a player controlled character..."
Grover is convinced there is a MONSTER in this hallway, and he does not want to see it, and does not want you to see it either. He is AFRAID of the monster. He will do anything he can to stop you from revealing the DANGEROUS, BIG, SCARY monster in this hallway. Even though his movement rate is low, he can zip out of sight and back into sight, covering unknown distances while out of sight — usually accompanied with the sound of madly shuffling dress shoes, though you NEVER SEE any dress shoes. He can thus produce resources that are improbable or impossible. Anyone trying to HARM lovable, furry, old Grover should discover it is a very difficult thing to do... The Judge is encouraged to invent any excuse, even those that are only very slightly realistic, for why an attack on Grover misses it's mark. Grover is very flexible, so maybe he has bent out of the way just as an arrow flies past him. Sometimes he goes from being NEAR to being FAR, just to make a point, and thus melee strikes will miss. He might be nailing up a crude wooden barrier to prevent anyone from revealing the MONSTER at the end of the hallway, and the back swing of his hammer might foil an attack against him. Players should feel free to invent reasons they miss, too. 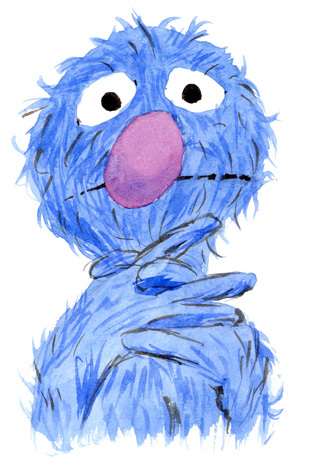 Anyone playing along with Grover and gently revealing to him that HE is the Monster in the hallway, and not making him feel bad by being embarrassed about the whole thing, should gain 2d3+1 Luck on the spot. FANTASTIC! EXCITING! IMAGINATIVE! Vol. 2! FANTASTIC! EXCITING! IMAGINATIVE! Vol. 2! — IN PRINT! Blog contents © 2012-2018 J. M. Wilson. Travel theme. Powered by Blogger.